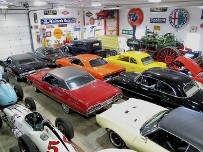 Classic Car Carrier, Inc. in Zionsville, Indiana, offers short-term and long-term renting of vehicle storage for automobiles, motorcycles, and all types of vehicles. Trust our staff to care for your prized possessions and make sure it is maintained and protected from harm. Our climate-controlled storage facility is well insulated, and offers a safe environment for your valuable vehicles. While in storage, we provide battery tenders and covers that will protect your car from accidental scratches and damages. We also occasionally start your cars and check the tires. Contact us today in Zionsville, Indiana, to inquire about the rates of our insulated vehicle storage.